Arnold Böcklin was Swiss born and one of the most important symbolist artists of central Europe. He began his career as a romantic landscape painter. He was always very interested in classical themes and made a trip to Italy and stayed there from 1850 to 1852 to study and absorb classical art and culture. He then returned there again and stayed from 1853 to 1857. It is obvious that he greatly admired classical themes in art. Many of his paintings depict the fantastic creatures of classical mythology. His paintings also are often described as "mood paintings." His work has also had an influence on many other artists. For example, Max Klinger worked under him and Bocklin's influence can be seen in many of his paintings. 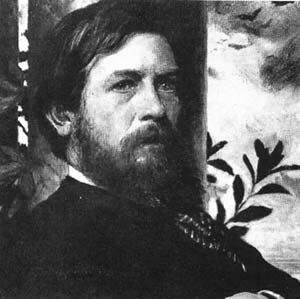 I have chosen to include Arnold Böcklin on my art of the Faerie Realm page because a significant portion of his art contains mythological themes. He painted many of the nature spirits from ancient Greek myths such as centaurs, naiads, nereids, nymphs, Triton, and Pan to name a few. Many of his painting if they didn't directly depict a mythical character, dealt with other mythical themes. For example, one of his most famous pieces "The Isle of the Dead", which he painted in 1880, could be interpreted as the boatman Charon ferrying souls to the otherworld across the river of Lethe. However, Böcklin himself described it as a painting to dream over. It was actually his art dealer, Fritz Gurlitz, who named the piece, "The Isle of the Dead." 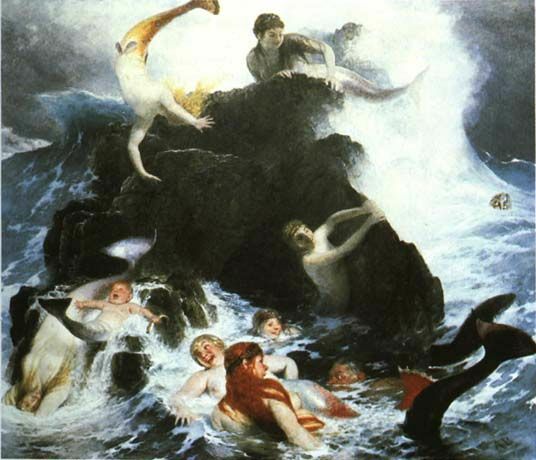 The painting below, "Naiads at Play" depicts the spirits of the ocean waters. You can just feel the energy, joy, and passion of the ocean here. You can almost feel the spray on your face. He makes the mythic become real in his paintings. Christian, John. Symbolists and Decadents. Park South Books, New York: 1977. Lucie-Smith. Symbolist Art. Oxford, New York and Toronto: 1972.